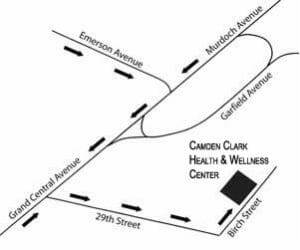 The Camden Clark Health and Wellness Center is located at 2804 Birch Street, Parkersburg, WV 26101. Mondays through Thursdays 5:30 a.m. – 9:00 p.m.
Fridays 5:30 a.m. – 8:00 p.m.
Saturdays 7:00 a.m. – 6:00 p.m.
Mon-Thu 5:40 a.m. – 8:50 p.m.
Fridays 5:40 a.m. – 7:50 p.m.
Saturdays 7:10 a.m. – 5:50 p.m.
Sunday 11:10 a.m. – 4:50 p.m. The pool opens 10 minutes after facility opens and closes 10 minutes before facility closing time.